By T.O.D. contributor David M.
Whole books, whole libraries, have been written on how long to keep a hole open and how big that hole should be. It doesn’t sound difficult. After all, I’ve just filled the kettle (yes, really – it’s starting to boil now) by opening the hole inside the tap and waiting until enough water had come out. If I couldn’t see the water in the kettle for some reason, I’d have to devise another system. I might try to listen very carefully and after suffering wet trousers a few times, I’d learn to get it right. I might hang the kettle from a spring balance. Or I might do a bit of testing and work out that if I turn the tap by just so much and count so many seconds, the proper amount of water will be in the kettle every time, even though I can’t see it. There now. Metering theory for photographers, all wrapped up in a familiar domestic analogy. There might be a bit more to it. Making a decent cup of tea is something that nearly half the people I know can manage, almost all of the time. Not all of them can take a photograph. Essentially, metering is deciding how much darkness to let out of the camera, to make room for the picture. We have two controls (well, there are others, but not now) – the size of the hole, which we call the aperture and the length of time, which we call the shutter speed. Happily for us, if we double or halve the time, it’s equivalent to doubling or halving the area of the hole (a note: not the diameter, the area.). Consequently we can juggle the two to give us some interesting effects like depth of field or motion blur, which are uniquely photographic. As soon as we start looking at different ways to meter a scene we discover that there are three methods. We shall instantly dismiss the most popular and reliable one, used for almost all the photographs taken in the world – the “Leave it to the Camera” method (LITTC). I’ve tried it, and it seems to work rather well. Even my friends who cannot make a cup of tea can do it, but our aim is not to make life easy. We may be rough diamonds in real life but photographically, we take the pot to the kettle and sip our tea with lifted pinkies. There are two sorts of light in photography: light that is coming back from the subject and light that is on its way to the subject. We can choose to measure either of them. It seems obvious to measure the light coming back from the subject, as that’s what we use to push the darkness out of the camera. The dark bits of the subject will have reflected less light and the light ones more. (The red bits will kindly reflect red light and the green ones green if we are of the chromatic persuasion). All we need to do is point our meter at the scene, press the button and read the readings, then transfer them to the camera. The clever people who made the meter and the camera have already got together, behind our backs, to make this work well, almost every time. This is essentially the same as the LITTC method, but it will impress casual bystanders rather more. Remember that we are the pinkie-lifters. Can we make things a bit more complicated? Yes we can. We may look more closely at the scene and decide that we want the shadowed side of this tree to be quite dark and this bit of sunlit grass to be quite light so we measure the tree and the grass individually. We might even use a spot meter to make it look more impressive. Happily, we will have done our homework and don’t just say “Quite dark and quite light”. We are the pinkie-lifters and we say: “Zone three and Zone seven”. The bystanders are amazed. Our homework has told us to “Expose for the shadows and develop for the highlights”, so we do that. The bystanders would swoon if they were in our darkroom. Our prints are better than our tea. With a bit of luck, our prints are excellent. How could we want more? There is more. We might not enjoy all that fuss and calculation or there may be no bystanders to impress. We can make things simple again. It’s an inconvenient fact that subjects are not always entirely co-operative, like the legendary black cat in a coal cellar or like snow and sand. If we don’t or can’t measure each Zone, these subjects will fool an ordinary meter. An ordinary meter will try to make the cat and the snow come out the same. Both will come out as a middling sort of grey and not at all like snow or cats. Remember the other kind of light – light on its way to the subject? Remember that the subject automatically alters the reflected light by being darker or lighter, (or red or green)? If only we had a convenient portable standard subject, we could meter that instead of the problematic cat or snow. A grey card might be just the thing, but it’s bulky and fragile and it will give us another problem. Because it’s flat, it will seem brighter or darker depending on the angle we hold it. Not impossible to manage, but probably more tricky than the spot meter. (I believe that Kodak originally devised the grey card for copying flat documents, not real-life scenes). A sphere might be an acceptable substitute for the real world as it can’t have any wrong angles, but how can we meter a whole sphere? Tricky, we say, very tricky…Light bulb moment! We make the sphere translucent and put the meter inside! That’s exactly how an incident meter works; it’s a portable standard subject. 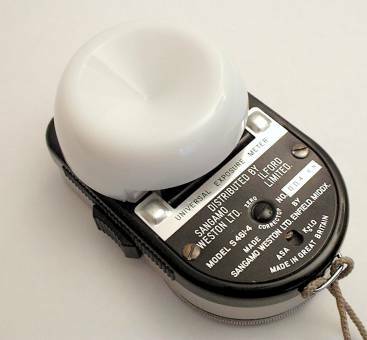 Incident meters have the usual sort of dials, but they also have a white translucent dome, which might not be entirely hemi-spherical. The Weston meters have quite a complicated dome, designed to work more efficiently. (If you care to investigate the Invercone, you’ll be impressed by the amount of thought that went into that small piece of plastic.) What we do is simplicity itself. We set up the camera as usual, take our meter and point the dome towards the lens, as if the dome is the actual subject, so that it catches the light in the same way. The bystanders will not believe their eyes, but we persevere. We take the reading as usual and transfer it to the camera, then click the shutter and set a course for our next assignment. As we have already done our homework on film speed and development, the negative will be just right, however inconveniently dark or light the subject may have been. Naturally, there is a caveat; it will be just right if it has a normal range of contrast. For unusual contrast, we shall have to use our plus and minus development controls, even though there will probably be no admiring bystanders in the darkroom. 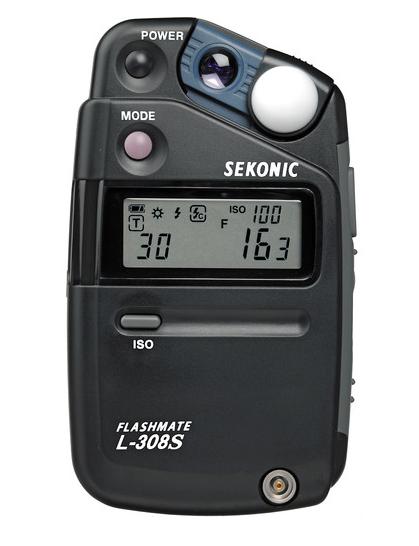 Incident metering is often used with flash units in the studio, where contrast can be controlled before exposure. In the good old days this would have been done using expensive large format transparency film, which is very picky about proper exposure. It would have been intended for even pickier paying customers too. I tend to use incident metering for roll film, and I usually try to finish whole rolls on any one outing. That way, all the subjects on each roll have more-or-less the same contrast and need the same development. If I can manage all this, with my own minimal pinkie-lifting skills, so can you. Earl Grey, man! Earl Grey. My wife likes Earl Grey, but I'm not sure about it unless there are cucumber sandwiches present. I usually drink Ceylon tea and there's a box of Yorkshire Tea in the cupboard because of my ancestry, together with some other occasional infusion-based treats. I'm halfway through my morning pot of coffee at the moment, but because I'm very good at insomnia, I shall avoid it later in the day. There is a photographic point to all this. I have my doubts about their specific recipe but some of the other hits may be more reliable. Those Cool Girls seem to be very experimental indeed – a refreshing change from those dour Zone System give-me-film-or-give-me-death websites. I.e. how to meter so that the sunlit ground is properly exposed by the figures pushed into shadow. Normal incident reading pointing towards the camera would show detail in the shaded areas, so what do you do. Meter normally and stop down 1 or 2 stops? How do you work it out exactly using incident readings? The Sergio Larain image is very fine. Well worth visiting the page. Thank you. Antonio is right. This is a special case and an incident meter would give detail in the shadowed side of the figures. Most of the picture-space is taken up by the sunlit paving and to my eye and on this screen, it looks to average out at about Zone Five. Rather than guessing a two-stop reduction, it might be better to meter the reflected light directly from the paving and let the figures fall where they will. Sometimes, it's no bad thing to have a little hint of detail in the shadows, so that you can decide, when printing, if you want to leave it out entirely. For example, the tiny amount of detail in the figures at the left-hand edge seem to make the solid blackness of the other figures more visually convincing. Although we read it as very contrasty, if we ignore the solid black of the shadows, it's actually a rather low-contrast image. This image does illustrate that meters are set up for "normal" scenes and this one is far from normal. If it were static, a spot-meter would be better, but obviously that would be impractical. It illustrates an interesting aesthetic point: there is no "subject" as such (friend, sunset, mountain, cathedral). We don't need to recognise the individuals in the image. We are being asked to admire and enjoy the whole momentary scene and the observational and visual skills of the photographer. There may be further comments to be made about development. It would benefit from careful control and Mr Robbins might be the man for that.